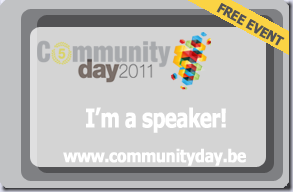 June the 23rd the Belgium user groups have another free event. It’s called the Community Day and this year they will celebrate their 5th anniversary! To celebrate this they invited some collegue-usergroups from across the border to speak there as well. Timmy Kokke from Sixin (http://www.sixin.nl) and myself will be there to talk about a number of items. What is a Natural User Interface? What are the design considerations for developing for Touch based systems? What do the APi’s look like? What makes Surface (1.0 / 2.0) so special? I am still working on this talk so I still have to iron out some details, but it will be a fast paced, fun and entertaining session. If someone also learns something that will be an added bonus.! So, if you are in the neighborhood on June 23rd, please stop by and visit this great event!